Platelet Rich Plasma – Let’s face it- most people would rather not have to go through any type of surgery, like a hair transplant- if they can avoid it. That is where the PRP (Platelet Rich Plasma) may suit your needs for your treatment of hair loss. PRP is a therapy that uses patients own blood to stimulate a healing response within a damaged tissue. Apart from red blood and white blood cells, our blood contains cells called platelets. The function of the platelets is to promote healing and aid in clotting of blood when a wound occurs. These platelets contain growth factors that promote regeneration of the cells in the body. PRP Hair loss treatment is safe, effective and FDA approved. Visit one of our Brampton or Vaughan clinics for a free hair assessment. Platelet Rich plasma (PRP) is a natural therapy that exploits the regenerative potential contained in our platelets, in order to induce tissue repair and new hair growth. PRP induces regeneration of the hair bulb environment, increasing blood supply and enhancing hair follicle cell proliferation, resulting in stronger, nicer hair for both men and woman. In stimulating the hair bulb environment, PRP provokes a natural process that results in strengthen hair. Its natural and “autologous*” quality excludes side effects. Vitality, color and brightness of the hair is enhanced, hair loss is slowed and hair restoration is activated. Although PRP technology is considered cutting edge technology, it has been initially developed 20 years ago for heart surgery to aid in wound healing. It has been used for years in surgical applications and wound care. 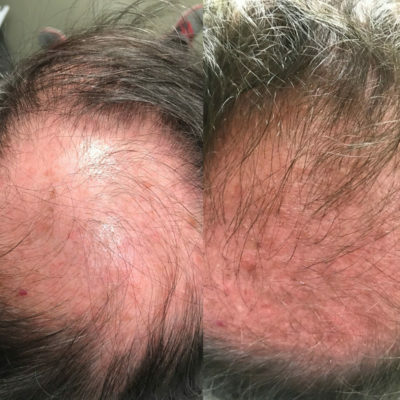 The use of PRP for the scalp is fairly new and evolving into a promising treatment for use both as an adjunct to a hair transplant and as a way to reverse hair loss. It is generally accepted that there is a significant response. I am so glad l met you. The team is very professional and knowledgeable. 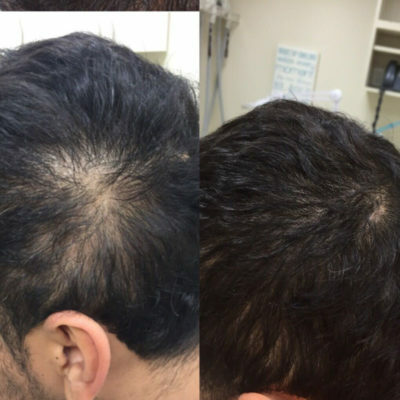 Since my first laser treatment to my PRP and vitamins l have noticed an amazing result with my hairs done scalp. I am no longer losing hair as l was and my problematic areas of hair loss are filling in with new growth. I would recommend the package to anyone who is experiencing hair loss and thinning. They are very caring towards the clients. Come in for a free no obligation assessment to learn more about PRP Hair Loss treatments and if you are the right candidate to receive PRP Hair Loss.